This year at Fryeburg Fair visitors found two new buildings. One of these was The Fiber Center. Located across from the 4-H Barn and between the Pulling Ring and the Llama Barn, this beautiful new structure replaces the old Fiber Tent. 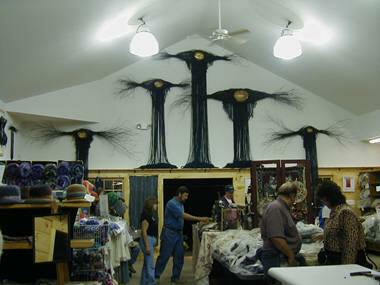 It is the new home of the fiber craft demonstrators and judging and sale of fleeces. With plenty of light under a lofty ceiling local fiber artists spend the week demonstrating spinning, knitting, felting, dyeing, weaving, rug hooking, and other fiber arts. You will find fiber from various breeds of sheep, alpaca, llama, angora, mohair and more. Demonstrations change daily. Visitors to the building are encouraged to ask questions and many learn a great deal about fiber in a very short visit. The building is open from nine in the morning to nine at night all eight days of the fair. If there is any aspect of fiber arts that interests you—you will probably find it here.